In 364 Pope Liberius sent Eusebius and Bishop Lucifer to Cagliari to the Emperor Constantius, who was then at Arles in Gaul, for the purpose of inducing the emperor to convoke a council which should put an end to the dissentions between the Arians and the orthodox. The synod was held in Milan in 355. 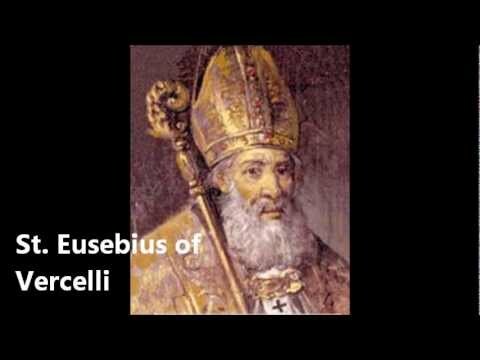 At first Eusebius refused to attend it because he foresaw that the Arian bishops, who were supported by the emperor, would not accept the decrees of the Nicene council and would insist upon the condemnation of St. Athanasius. Being pressed by the emperor and the bishops to appear at the synod, he came to Milan, but was not admitted to the synod until the document condemning St. Athanasius had been drawn up and was awaiting the signature of the bishops. Eusebius vehemently protested against the unjust condemnation of St. Athanasius and, despite the threats of the emperor, refused to attach his signature to the document. As a result he was sent into exile, first to Scythopolis in Syria, where the Arian bishop Patrophilus, whom Eusebius calls his jailer, (Baronius, Annal., ad ann. 356, n. 97), treated him very cruelly; then to Cappodocia, and lastly to Thebaid. On the accession of the Emperor Julian, the exiled bishops were allowed to return to their sees, in 362. Eusebius, however, and his brother-exile Lucifer did not at once return to Italy. Acting either by force of their former legatine faculties or, as is more probable, having received new legatine faculties from Pope Liberius, they remained in the Orient for some time, helping to restore peace in the Church. Eusebius went to Alexandria to consult with St. Athanasius about convoking the synod which in 362 was held there under their joint presidency. Besides declaring the Divinity of the Holy Ghost and the orthodox doctrine concerning the Incarnation, the synod agreed to deal mildly with the repentant apostate bishops, but to impose severe penalties upon the leaders of several of Arianizing factions. At its close Eusebius went to Antioch to reconcile the Eustathians and the Meletians. The Eustathians were adherents of the bishop St. Eustatius, who was deposed and exiled by the Arians in 331. Since Meletius' election in 361 was brought about chiefly by the Arians, the Eustathians would not recognize him, although he solemnly proclamed his orthodox faith from the ambo after his episcopal consecration. The Alexandrian synod had desired that Eusebius should reconcile the Eustathians with Bishop Meletius, by purging his election of whatever might have been irregular in it, but Eusebius, upon arriving at Antioch found that his brother-legate Lucifer had consecrated Paulinus, the leader of the Eustathians, as Bishop of Antioch, and thus unwittingly had frustrated the pacific design. Unable to reconcile the factions at Antioch, he visited other Churches of the Orient in the interest of the orthodox faith, and finally passed through Illyricum into Italy. Having arrived at Vercelli in 363, he assisted the zealous St. Hilary of Poitiers in the suppression of Arianism in the Western Church, and was one of the chief opponents of the Arian Bishop Auxientius of Milan. The church honours him as a martyr and celebrates his feast as a semi-double on 16 December. In the "Journal of Theological Studies" (1900), I, 302-99, E.A. Burn attributes to Eusebius the "Quicumque". Three short letters of Eusebius are printed in Migne, P.L., XII, 947-54 and X, 713-14. St. Jerome (De vir. ill., c. lvi, and Ep. li, n. 2) ascribes to him a Latin translation of a commentary on the Psalms, written originally in Greek by Eusebius of Cæsarea; but this work has been lost. There is preserved in the cathedral at Vercelli the "Codex Vercellensis", the earliest manuscript of the old Latin Gospels (codex a), which is generally believed to have been written by Eusebius. It was published by Irico (Milan 1748) and Bianchini (Rome, 1749), and is reprinted in Migne, P.L. XII, 9-948; a new edition was brought out by Belsheim (Christiania, 1894). Krüger (Lucifer, Bischof von Calaris", Leipzig, 1886, 118-30) ascribes to Eusebius a baptismal oration by Caspari (Quellen sur Gesch, Des Taufsymbols, Christiania, 1869, II, 132-40). The confession of faith "Des. Trinitate confessio", P.L., XII, 959-968, sometimes ascribed to Eusebius is spurious.